We may have food down cold, but wine? This is where we’ll conquer it. Join us; we don’t want to drink alone. Today: Transition gracefully into fall with a complex, lighter-bodied red. Early fall is a beautiful, bittersweet time of year. The weather is warm but not steamy; we’re holding on to lingering memories of summer’s long, lazy days; and we’re (almost) ready to turn up the heat again, both in our homes and in our ovens. It’s time to think about wines that go with all of that. For me, the lighter-bodied red wines of Rioja, Spain strike just the right balance. Their deep, rich color comes from the Tempranillo grape, and their flavor profile is more gentle than overbearing — which is exactly what we want from “transitional” foods that bridge summer and fall. More: Pair your Rioja with Catalan escalivada. But it’s the distinctive aromas of Rioja wines that get me every time. They’re savory — almost peppery — but without a sharp bite. The edge has been taken off of many Rioja wines — the same way that the edge is taken off of foods that are cooked, or roasted, or baked. It’s that mellow camaraderie that makes Rioja wines a perfect pairing for the foods on your table this season. The wines of Rioja have an ace up their sleeve: time spent aging, in both bottles and wooden barrels. The duration of that aging process is a legal requirement and depends on the tier: Wines labeled “Crianza” are aged at least two years; “Reserva” wines are aged at least three years; and “Gran Reserva” wines are aged at least five years. Rioja, in other words, takes its time. This particular producer takes it even further: Every six months during the aging process, the wine is separated from the sediment that’s naturally dropped to the bottom of the oak barrel. Winemaker Mercedes López de Heredia calls it “educating the wine,” or taking something rough and making it softer, more elegant, and easier to drink. The Tondonia wine pairs perfectly with meat dishes, but especially grilled lamb, a specialty of the region. Try it with Grilled Lamb with Eggplant, Mint, and Feta or Chimichurri Lamb Chops. Or, since it’s a lower-alcohol wine (12.5% ABV), you could also just open a bottle, pour a glass, light the grill, and ease yourself into dinnertime. The result of the aging process in Rioja is more complex wine. These wines are less strong and more classic in style — which means that they are versatile enough to pair anything from appetizers to pasta to barbecue. Take the Viña Alberdi from La Rioja Alta. Its sweet-spicy aromas complement an appetizer like Smoky Fried Chickpeas. Or, since you can’t think of Spain or Rioja and not think of tapas, try the Viña Alberdi with Serrano Ham and Manchego Croquetas with Smoked Pimentón Aioli. The body and flavor of the Viña Alberdi also embraces a savory, spiced pasta dish like “Greek” Lamb with Orzo; the lamb and olives in this recipe make it an especially well-matched choice. Or, to extend the barbecue season a few more weeks, try the complex Viña Alberdi with straightforward Salt and Pepper Babyback Ribs; their playful counterbalance gives your taste buds plenty to enjoy. Tilt a glass of Viña del Olivo forward and you’ll see a deep, almost black-colored core at the center and purple tints toward the rim. Then put your nose in the glass: Do you smell the violets? Take a sip: Do you taste the olives? It may just be the power of suggestion — this is a wine named after an olive tree in the middle of a vineyard, after all — but Viña del Olivo offers those unique and very layered sensory experiences in your glass. It’s that savory quality on the palate, so distinctive to Rioja, that encourages you to linger over every sip. Take your time with the Viña del Olivo. Sit. Talk. Sip a little more. Take another bite, maybe of something like Sweet and Savory Overnight Roast Pork, that’s equally layered in flavors. Viña del Olivo is a complex wine that spent time evolving before it made its way to your table. Give it the opportunity to evolve even further, in the glass and in your mouth. 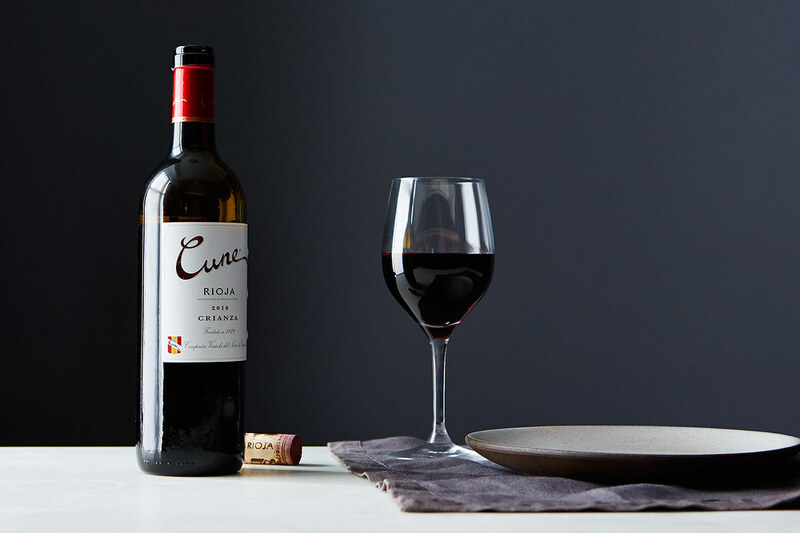 Whether it’s a complex wine like Viña del Oliva, or its simply elegant sister-wine the Cune Crianza, Rioja reds are the perfect bridge to carry us from summer to fall.